Mmmmm! Glowing colours, clever juxtaposition of shapes! I love the horizontal blinds against the rounded tulip shapes, and the brilliant purplish-whitish vertical element on the left. And … SPRING! LOVELY. Simply gorgeous! I love these rich colours and the radiance, the composition, everything. The lines on the window frame and blinds contrast beautifully with the softer curves of the flowers and leaves. This looks almost like a painting, Carin. How did you get the effect (e.g., the colour on the blinds)? Love the colour layers here, Carin and the soft petals against the straight lines of the blinds! The light play through the blinds and off the tulips is stunning. 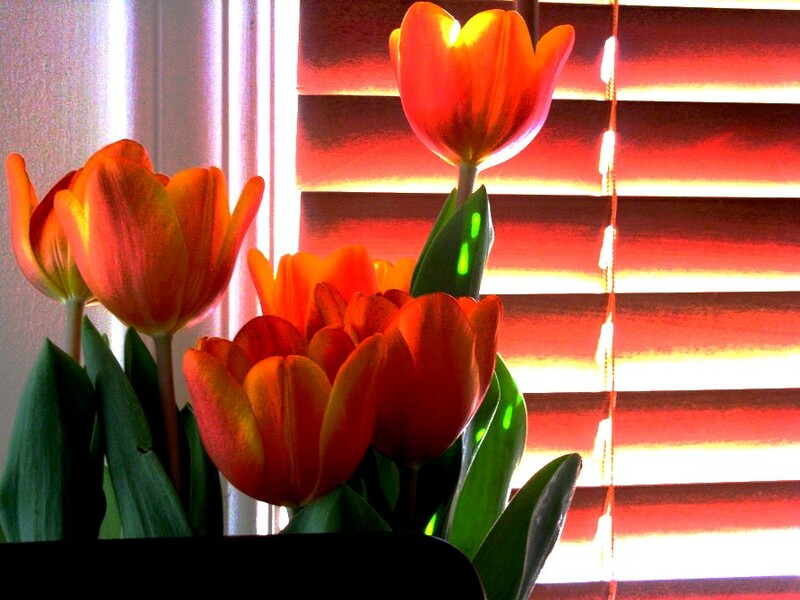 So … a great decorating idea to buy blinds colour co-ordinated with your tulips! I’m nothing if not a trove of decorating ideas… [ahem]. So pretty. I love the rich color. I love the contrast between the linear pattern of the blind and the voluptuousness of the flowers. A gorgeous tribute to spring!